EL PASO – An art installation that will transmit conversations back and forth across the border on light beams is among 14 finalists that could receive up to $1 million each in the 2018 Bloomberg Philanthropies Public Art Challenge. UTEP’s Stanlee and Gerald Rubin Center for the Visual Arts, along with the Cities of El Paso and Juárez, teamed up to pursue the funding for a joint cross-border art installation. 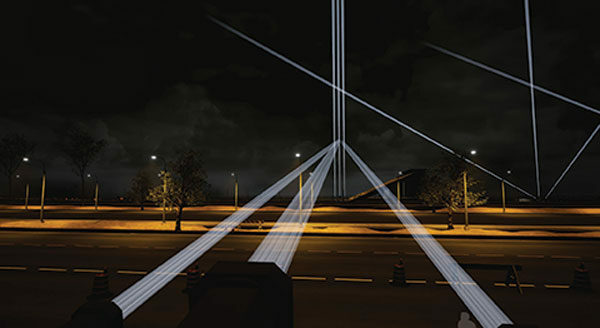 The proposed art installation is titled “Border Tuner.” The project, led by artist Rafael Lozano-Hemmer, includes a series of light and sound installations that will connect El Paso and Juárez with robotic searchlights that make a bridge of light. The light sources open bidirectional live sound channels that allow people from each side of the border to communicate with each other from three stations at Juárez’s Chamizal Park and three at Bowie High School in El Paso. In February, Bloomberg Philanthropies invited mayors from U.S. cities with a population of 30,000 or more to submit proposals for temporary public art projects. More than 200 cities applied with proposals that fostered creative collaboration, addressed civic issues and supported local economies through public art. Bloomberg Philanthropies will select at least three winners among the 14 finalists in the fall to execute their projects over the course of 24 months. The grants will cover project-related expenses but will not fund 100 percent of the total project costs. Other participating foundations for the El Paso/Juárez art project include the El Paso Community Foundation, Fundación Comunitaria Paso del Norte and the state government of Chihuahua.